Egyptian novelist Ahdaf Soueif reflects on the determination of Egyptians, after the ousting of President Hosni Mubarak, to rebuild their country and reclaim their national identity. I have friends on anti-depressants who, over the last 20 days, forgot to take their pills and have now thrown them away. Such is the effect of the Egyptian Revolution. On Friday night, Egypt partied. Chants and songs and drums and joy-cries rang out from Alexandria to Aswan. The defunct regime was only mentioned in reference to "we want our money back". Otherwise, three chants were dominant - and very telling: One - "Lift your head up high, you're Egyptian" - was a response to how humiliated, how hopeless we'd been made to feel over the last four decades. The second was: "We'll get married, We'll have kids," and reflected the hopes of the millions whose desperate need for jobs and homes had been driving them to risk their lives to illegally cross the sea to Europe or the desert to Libya. The third chant was: "Everyone who loves Egypt, come and rebuild Egypt." And on Saturday, they were as good as their word: they came and cleaned up after their revolution. Volunteers who arrived on Tahrir [Square] after mid-day found it spick and span, and started cleaning up other streets instead. I saw kids perched on the great lions of Qasr el-Nil Bridge buffing them up. I feel - and every parent will know what I mean - I feel that I need to keep my concentration trained on this baby, this newborn revolution - I need to hold it safe in my mind and my heart every second - until it grows and steadies a bit. Eighty million of us feel this way right now. Eighty million at least - because the support we've been getting from the world has been phenomenal. There's been something different, something very special, about the quality of the attention the Egyptian revolution has attracted: it's been - personal. People everywhere have taken what's been happening here personally. And they've let us know. And those direct, positive and emotional messages we've been receiving have put the wind in our sails. We have a lot to learn very quickly. But we're working. And the people, everywhere, are with us. In the week before the protesters achieved their goal, Ahdaf Soueif reflected on some of the humorous and poignant moments in Cairo's Tahrir Square. What is happening on the streets and squares of Egypt is extraordinary; it's nothing less than millions of people re-finding their voice - and using it. They're using it to demand the removal of Hosni Mubarak and his regime - with everything that that regime entails: the corrupt cabinet, the fraudulent parliament, the mutilated constitution and the brutal emergency laws. And this common, over-arching demand is being given increasingly creative and individual expression. The atmosphere on Tahrir Square is like - well, imagine a fair, where the product under scrutiny is politics, economics, governance, history and the law. Circles of people sit on what's left of the grass to talk, friends stroll arm-in-arm discussing, marchers go by chanting and singing, bands play old protest favourites and new-minted anthems. People carry home-made placards with their own messages. The most common, of course is "Irhal!" ("Depart!"). But with the days passing, I've seen more impatient ones like "Irhal, my arm's hurting", "Irhal, I really need a shower", "Irhal, I can't find another joke", "Irhal means leave", and others. One man has outlined a huge airliner on the ground with used paper cups and keeps everyone out of its outlines because the plane's ready to whisk Mubarak away. A huge sheet of plastic pockets has been hung up and the pockets are speedily filling with caricatures. This revolution is so organic, so personal, so real, it has exploded reservoirs of creativity in everybody taking part. Each person coming to the square brings something: medical supplies for the field clinics which are still treating the people damaged by Mr Mubarak's police and thug militias, blankets for the thousands spending the night, cartons of water, biscuits. Teams of young volunteers collect litter. The resulting piles are labelled "National Democratic Party". This is not to say that all is well with us. The government has, for the moment, withdrawn its police and its thug militias and the army sits on the periphery of Tahrir Square - to protect us. But the army has now put up barbed wire to narrow the entrances and exits and they're trying to move their tanks further into the square. When the young people lay down in front of the tanks Sunday night, they fired volleys of shots into the air and dragged away three young men and beat them. The situation was diffused when a well-liked public figure intervened. This is what we older revolutionaries are doing - putting everything we have at the service of the brave young people who have cleared a space from which we can all join the effort to reclaim our state. Tahrir has become our civic space where leftists and liberals and Muslim Brotherhood discuss and sing and eat together. The other cities and towns of Egypt have sent popular delegations. The consensus is that the consensus will come out of Tahrir. And one thing that Tahrir has already given us is a sense of who we are. People are actually articulating: "They said we were divided, extreme, ignorant, fanatic - well here we are: diverse, inclusive, hospitable, generous, sophisticated, creative and witty." In Philip Pullman's Northern Lights, the aim of the evil guys is to sever children from their spirits so releasing the energy needed by the government. Well, that's a brilliant metaphor for what we feel has been happening to us in Egypt. We were being deliberately severed from everything we hold dear, in the service of keeping the region subservient to American and Israeli interests. And the only Egyptians to gain anything by this were the members and cronies of the regime who amassed spectacular wealth at the material, moral and emotional expense of their fellow-citizens. 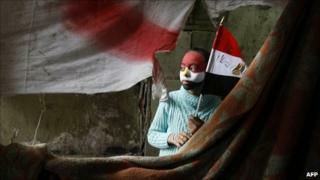 On Sunday in Tahrir, Christian masses were celebrated and Muslim prayers were said. We all prayed together for the young people killed by the regime since 25 January and before. Later, there was a wedding, and later still magicians and acrobats and small camp fires. This enormous revolution that is happening in our streets and our homes is the Egyptian people reclaiming their state, their heritage, their voice, their personality. Ahdaf Soueif is an Egyptian novelist and political and cultural commentator, who lives with her children in Cairo and London.